June is a pretty hot month for us at Wake-Up Call. Well, to be honest, we were actually freezing in the rains-battered and flooded Central Europe, as we travelled to Vienna to facilitate sessions on climate and energy politics and to train 30 young activists from all corners of Europe in campaign strategy planning at the EnCaTra training, organised by Federation of Young European Greens in the beautiful capital of Austria. But the energy and enthusiasm of the EnCaTra’s participants raised the emotional temperature considerably higher than what would be considered sustainable for our planet. 🙂 This warm event gave us enough energy to continue the trip to our next destination – Istanbul, where a number of our friends and comrades have already converged to join the protests in Gezi Park and to help prepare for the Global Power Shift that is coming to that city in less than two weeks from now. A slogan that we saw at one of the demonstrations that we recently took part in: “A tree fell down, a nation woke up”. We hope that similar wake-up call for democracy is coming to many corners of the world, as it already did in Tunisia and Egypt, and is currently happening all across Turkey. On the 7th anniversary of Al Gore’s famous documentary ‘An Inconvenient Truth’ we are packing our bags to go to Istanbul to participate in Al Gore’s Climate Reality Leadership Training, where we and few other of our friends from Sweden will be trained as effective climate communicators and organisers. Few days after that first training we are going to attend another one – ‘Training for Trainers’ – with the awesome facilitators from Training for Change. And then it’ll be our turn to flex our “facilitator’s muscle” and to spend a week with seventy young climate leaders from over 135 countries of the world, coaching them in story-telling techniques and the story-based campaign strategy. Among those participants will be our own colleagues from Wake-Up Call and our close friends and allies from PUSH Sverige. How exciting is that?! Very! We are so psyched up that we can barely contain ourselves! 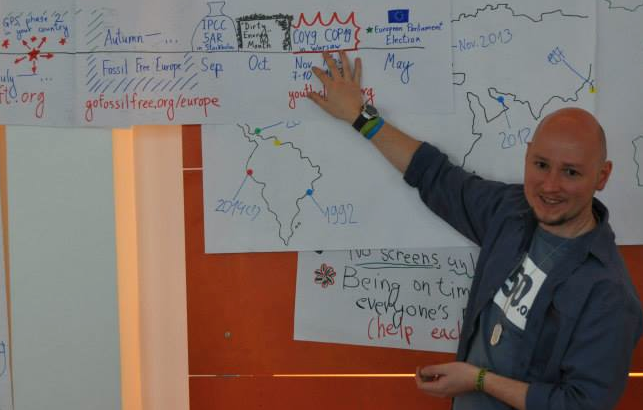 Come back to this blog and tune into Wake-Up Call’s Facebook page and Twitter account for more updates from Istanbul, from Al Gore’s Climate Reality Leadership Training and from the Global Power Shift! 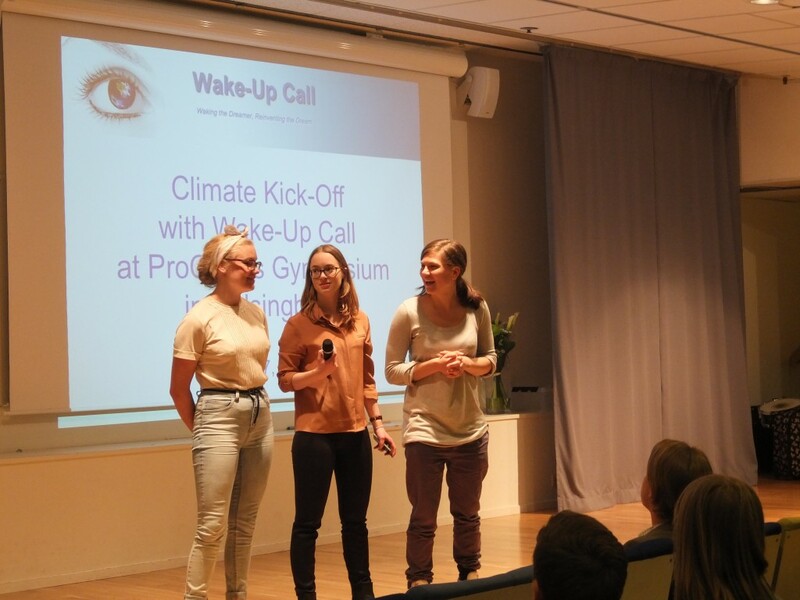 Wake-Up Call was invited to ProCivitas Private Gymnasium in Helsingborg to organise an explosive Climate Kick-Off for their Year 1 and Year 2 students. So the six of us – Oleg and I coming from Gothenburg, Andréa from Uppsala, Lovisa from Stockholm, and Maja coming from Lund – all arrived in Helsingborg one warm and sunny Friday to share our knowledge and enthusiasm about this topic and to inspire the students to get active too! After Oleg Izyumenko welcomed the students and introduced Wake-Up Call and the team, it was time to start with a presentation ‘All About Climate’. Lovisa Lundgren presented how the climate is changing and why, and masterfully explained the science behind the climate change. Even those students who may already have heard about climate change in general were surely given new insights and facts when she spoke about possible feedback effects or presented how many of the global hectares are needed to support our lifestyle today. 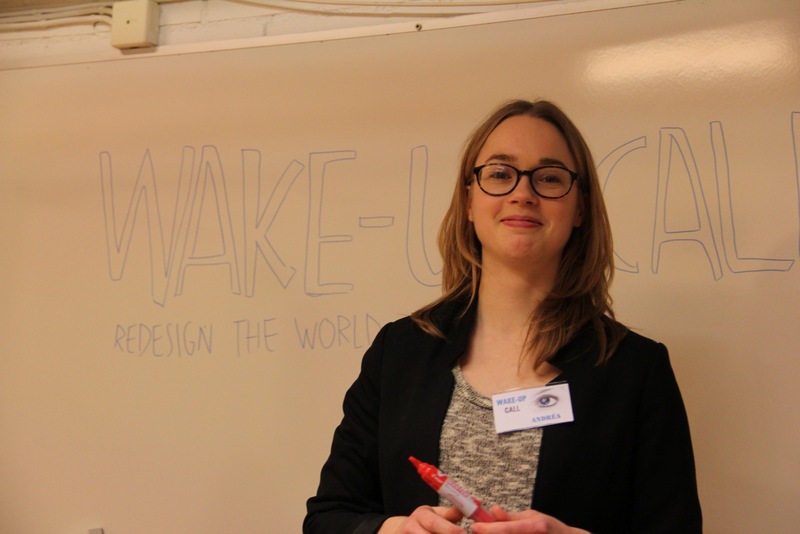 To underline that the warming of the planet is not as good as it might sound to a freezing Swede or German, Lovisa also presented the ecological and social consequences and costs of climate change, bringing in her own experience from her stay in Bangladesh. Having understood the importance of climate change, the next logical question was: “What can we, as young people, do about it?”. 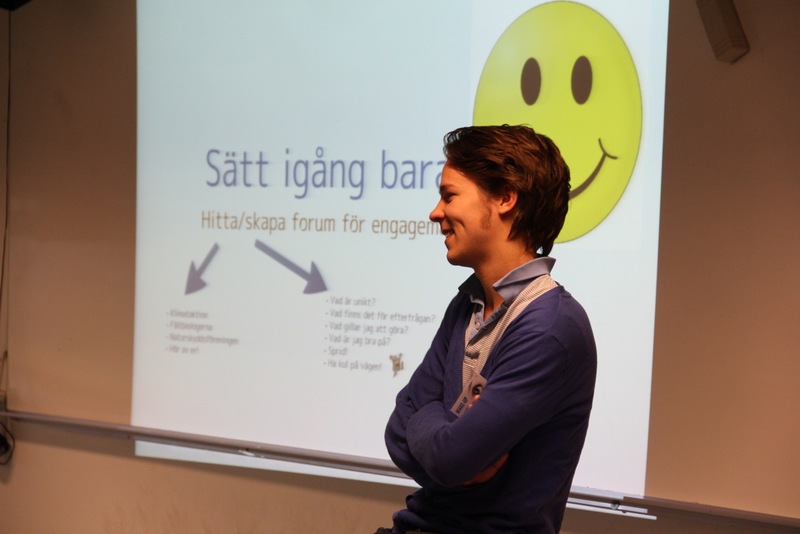 Andréa Henriksson presented motivating examples of young people engaged in the climate movement. Also this year, many young Swedes will travel to the negotiations in Poland, COP19, and will participate in the Conference of Youth (COY9) that will take place in Warsaw on November 7–10th. Aside from that, there’s a number of other fun ways to get active, like joining a local environmental group, starting a group of their own, or developing their own idea and putting it into practice. The final day of the Young Ideas for Europe’s project week in Stockholm started off with a nice doze of excitement and nervousness from the participants of the project. 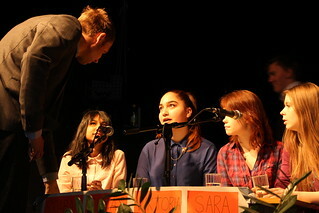 After some last minute preparations and a sound check, this year’s political patrons and sponsors of the project entered the Aula at the International English Gymnasium Södermalm (IEGS) to mingle with the participants on stage. 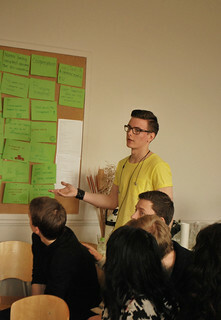 The Aula was filled with the vivid noise from the ideas and opinions being shared and discussed. 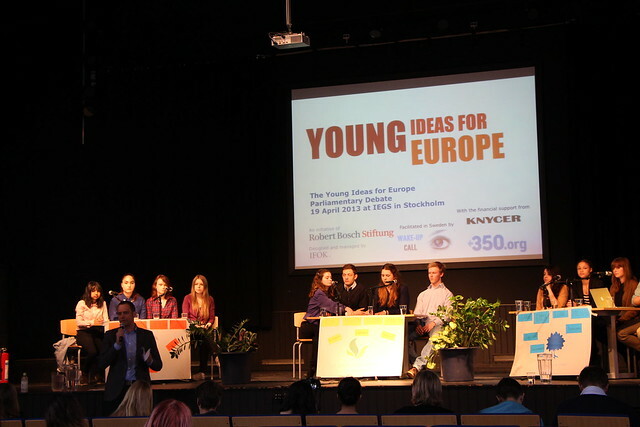 “It’s the End of the World As We Know It” was the quote from R.E.M.’s song that the Day 2 of the Young Ideas for Europe at the International English Gymnasium Södermalm started with. Anna Bengtsson from the Swedish Society for Nature Conservation (Naturskyddsföreningen in Swedish) held a great presentation about climate solutions and a discussion with the project participants. The students discussed how we can actually change the world – as individuals and as a strong youth generation. We need to change our lifestyle, but we also have to get the politicians to act. During the previous day the participants developed their own ideas regarding how they want the future of EU’s and Sweden’s climate and environmental regulation look like. Today was the day filled with meetings with the experts in this field and the day’s main purpose was to discuss and test those ideas. Next to Anna, we also got to meet Maria Wetterstrand, a former spokesperson for the Green Party of Sweden, and Johanna Lakso, a founder of the Swedish Youth Climate Movement (PUSH Sverige). 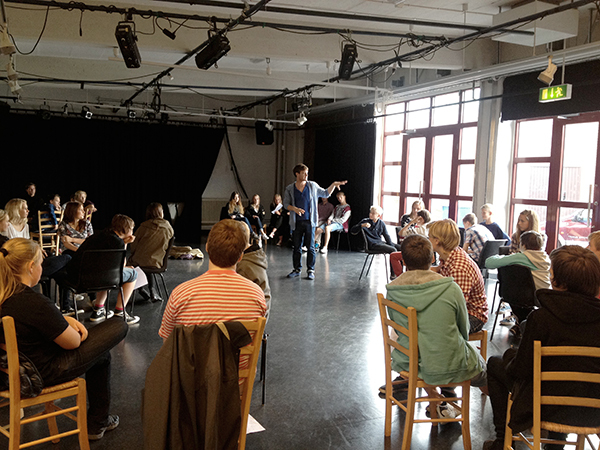 For 25 students at the International English Gymnasium Södermalm (IEGS) in Stockholm this week will be quite extraordinary. They won’t have their normal curriculum with Math, History, and Swedish on the schedule, but instead will work full-time with developing visions for Europe’s future energy policies. 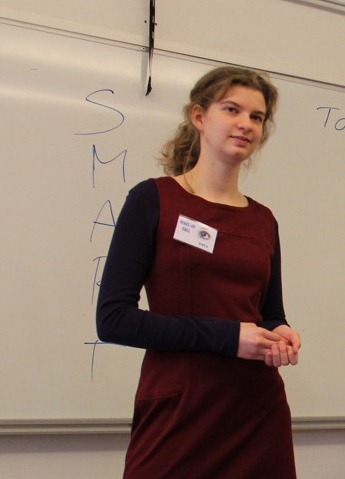 The project week, happening simultaneously at IEGS in Sweden and at a partner school in Lithuania, is a kick-start for this year’s cycle of the EU-wide project called Young Ideas for Europe and will be facilitated by Wake-Up Call for the third time in Sweden. Last Friday we had a meeting with the students to introduce the coming project week and discuss broad energy trends and issues with them. Next to discussing practical questions – What each day’s agenda will look like? What will be happening? Who is Wake-Up Call? – we took a first glance at the need for new European energy policies. Also, the students got materials about the EU, its political institutions, its decision-making procedures and its role in the modern world, for further preparations at home. What does it mean to be a trainee with Wake-Up Call? To be a trainee at Wake-Up Call is exactly what it sounds like: to train. To train working with many new and different things. But first and foremost to train to deliver a public presentation, speak in front of the audience and lead workshops. In the blog post below one of our wonderful trainees, Tova Melin, shares her experiences with you. During the last couple of months we keep on working on our own presentations about the climate crisis, climate solutions and youth climate action. We also train to make a public presentation. For now the public is limited to our colleagues: the other trainees and Oleg, our “coach”. Following the same method that we use in all our presentations we create our own stories and illustrate them with pictures, music and videos. I myself working on a version of “Youth Change the World!”, a multimedia story-telling experience full of emotional pictures, stark colours and inspiring examples of youths already engaged in the climate movement. This presentation shall get our listeners start reflecting over who we are as a generation, in a world full of changes and challenges. It shall also inspire us to think positive and start act ourselves, here and now. It’s Friday morning and I’m on my way to the second day at a conference on Education for Sustainable Development, arranged by the municipality of Uppsala. The conference filled with people from all community sectors, and with the mutual denominator that we’re all interested in “education” and “sustainable development”. Wake-Up Call was not only there to inform about our work, but also to learn more about the subject and meet engaged people. 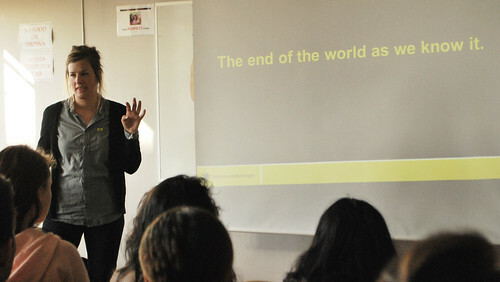 The conference had kick started the day before with a theoretical briefing about education in sustainable development. Docent David O. Kronlid got us to think about semantic questions such as “should we call it education about/of/in sustainable development or something else?”. He also showed us models about how to discuss whose responsibility the climate changes could be. Great thoughts and very interesting. But not everything was kept theoretical. There is a large amount of opportunity and time allocated to discussion and critical thinking. We have met sp many people interesting in exactly the same questions as us. We’ve got to inspire and get inspired, connect, and gain lots of knowledge. Tonight is the kick-off mingle event for Stockholm Students for Sustainability, or as they are more affectionately known as, Triple S! Wake-Up Call Stockholm has been invited to speak at their event tonight and we will give a speech about networking, leadership and student engagement as well as lead a networking activity to get people talking! Triple S is a student initiative started at Karolinksa Institutet. The goal is to create an inter-university student network between all the colleges and universities within the Stockholm Region. They have many exciting future plans to bring together students from across the city to gain momentum and voice for pressing environmental issues and new initatives that these students are passionate about! All students are welcome to attend and join the network! Ideas for campaigns, practical every day actions, videos and demonstrations quickly began pouring onto students’ paper. 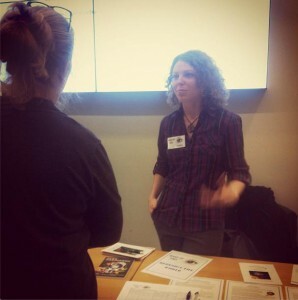 Jennifer Unelius (right) facilitates group work. The 6th of November, 9 am, on train from Uppsala to Stockholm: three Wake-Up Call trainees, literally just woken up ourselves, carefully going through the workshop material we’d read, discussed and rehearsed so many times before this date. We were ready. 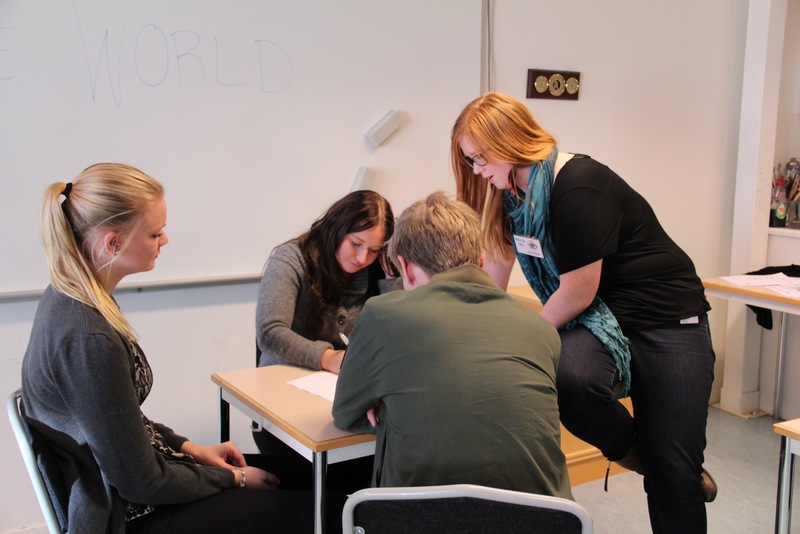 Heading towards Täby Enskilda Gymnasium where we were about to facilitate Wake-Up Call’s Redesign the World workshop. We had good reason to feel excited, mixed with an appropriate amount of nervousness. 11 am, Täby: At the school we were greeted with guest passes and cool Wake-Up Call nametags that made us look almost as professional as they made us feel. The first workshops facilitated by the other half of our Wake-Up Call Stockholm team were already running – and running well, we were told. Feeling increasingly optimistic, we headed to meet the students. There were 23 of them and they all had their eyes fixed on Lorentz who was briefing them on climate change: the science, the politics and the incredibly inspiring youth climate action that is already making a difference all over the world. I was happy to notice that however gloomy the state of the climate (not to mention the politics) may often seem, the audience didn’t look too gloomy, which was perfect because soon it was time to get to work – and not just for us but for the students. Lorentz Tovatt is firing up students for climate action. In a positive way, of course! As soon as we’d kicked off the workshops we were reminded of why Wake-Up Call chooses to work with youth in finding sustainable solutions to the climate crisis: ideas for campaigns, practical every day actions, videos and demonstrations quickly began pouring onto their papers. This time the students had a set time period of three weeks in which they will realize their plans and present their work to others. Every morning between September 11th and 20th, 90 junior high school students from the municipality of Kristianstad went to the Cultural Center Barbacka to forget everything associated with homework, information overload and writing school assignments á la 4-A4-pages-12-points-Times-New-Roman-1,5-line space. Wake-Up Call was there to do what we do best – to let the youths learn how to channel their energy into a space where ideas just start popping up in your head, and then you turn those ideas into real action – a real action that changes the world. But how does it work? Every day began with theater – a quick show FROSSA with and by the Theater Barbara. What is FROSSA?, you may wonder. In FROSSA we meet three climate communicators. Their Power Point is loaded with pictures and statistics, but in front of the audience’s eyes the argumentation crackles and the characters drift apart from each other. FROSSA is about the climate threats but also about individuals’ double accounting – about gender, power and why the word “tipping point” is not to be mentioned in the debate.